In the first segment of this video, a brown howler monkey displays his or her guttural call in a federally-protected reserve in southeastern Brazil called RPPN Feliciano Miguel Abdala. 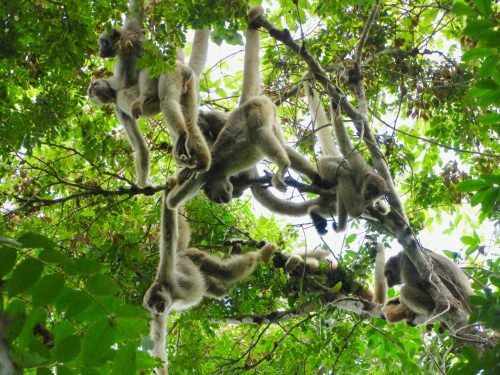 In the second segment, muriqui monkeys roam the forest floor. Credit, part 1: Jefferson Cordeiro, Muriqui Project of Caratinga. Credit, part 2: K.B. Strier, Muriqui Project of Caratinga. Yellow fever, a virus carried by mosquitoes and endemic to Africa and South America, has robbed the private, federally-protected reserve of its brown howlers in an unprecedented wave of death that has swept through the region since late 2016, killing thousands of monkeys. Using what in some cases are decades of historical data, Strier and a team of Brazilian scientists focused on studying primates in Brazil’s patchwork Atlantic Forest are poised to help understand and manage what happens next. They have never seen monkeys perish in such numbers, so quickly, from disease. With her Brazilian counterpart Sérgio Lucena Mendes, a professor of animal biology at the Universidade Federal de Espirito Santo, and their former postdoctoral researcher, Carla Possamai, Strier is ready to census the monkeys that remain at the reserve, comparing the new data to prior censuses performed in the forest. They also plan to study how the surviving brown howler monkeys regroup and restructure their societies, since their existing social groups have been destroyed. Strier’s study forest, just 4 square miles in size, is a land-locked island of green surrounded by agricultural and pasture lands. How yellow fever showed up here is a mystery, and the monkeys in the forest have nowhere else to go. 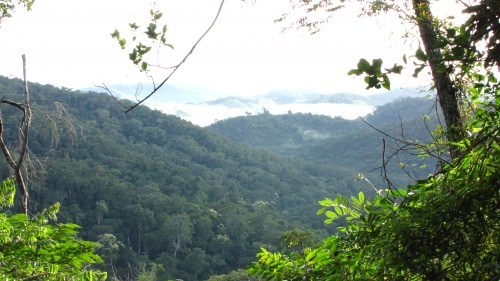 Less than 10 percent of Brazil’s Atlantic Forest remains intact and much of it exists only as small patches in a fragmented landscape. The way yellow fever has spread also concerns Brazilian health officials. As of mid-March 2017, they have confirmed more than 400 human cases of the disease, mostly in Minas Gerais, causing nearly 150 human deaths. The Brazilian Ministry of Health is investigating another 900 possible cases and concern is mounting that it will spread to cities, threatening many more people. Brazilian authorities also want to protect the monkeys from people who fear the animals may be spreading the disease. “We need to show that they help inform when the virus arrives in a region, because being more sensitive than humans, they die first,” Mendes explains. A dead monkey is like a canary in a coal mine, alerting public health officials that a pathogen may be present, mobilizing preventative and precautionary efforts. So, what does it mean when so many have perished? Nearly two decades ago, Strier helped expand and secure protection for the primates at her study forest, which include four monkey species: the brown howler, the black capuchin, the buffy-headed marmoset and, Strier’s animal of interest, the critically-endangered northern muriqui. It is too soon to say whether the howler monkey population can recover but Strier remains optimistic, in large part because of a career spent studying and helping conserve the brown howler’s main competitor, the muriquis. “The muriquis have shown us that it’s possible for small populations of primates to recover if they are well-protected,” says Strier. When she first arrived at her study forest, known as RPPN Feliciano Miguel Abdala, there were just 50 muriquis. By September 2016, there were nearly 340, representing one-third of the species’ total known population. The animals reside in just 10 forests in southeastern Brazil and nowhere else in the world. Strier’s efforts and those of her colleagues have helped restore their numbers. She is relieved that, so far, the muriquis appear to be less susceptible to yellow fever. “It was really tense – scary – to go into the forest, knowing the howlers were gone but not knowing how bad things might also be for the muriquis,” Strier recalls. Her long-term studies have revealed that muriquis have a lifespan of more than 40 years and she has known some of the individual muriquis in the forest their entire lives. Strier can recognize individuals based on natural differences in their fur and facial markings. Now, in the face of ecological tragedy, she and her colleagues have an opportunity to study how the muriquis adapt in a forest nearly devoid of their competitors. She has documented that kind of behavioral flexibility before. In the late 1980s and early 90s, the muriquis began splitting into smaller groups. In the early 2000s, as their population grew, they began spending more time on the ground, rather than in the trees, often consuming fallen fruits and even half-eaten “leftovers” under the trees. To raise awareness about and funds for her muriqui project, Strier is working with the Brazilian non-profit that administers the reserve, called Preserve Muriqui, and Global Wildlife Conservation, a Texas-based non-profit dedicated to conserving the diversity of life on earth.